My husband, three daughters and I work every Saturday at a place called Oxford Orion FISH. It is a food pantry for our town of Oxford and neighboring community of Lake Orion. The girls love going and meeting other kids from the area and knowing that they are doing something good for our neighbors and friends. I'm a Reiki practitioner and volunteer at our local no-kill shelter. I get back soooo much more than give. 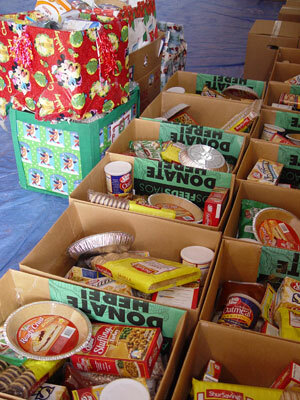 We clean out and organize our cupboards in December and take as much as we can to the food bank. I always buy extra canned stuff so when the food drives start, I always have something I can give. Gingee and I will kick off as Hug-A-Pet volunteers here in Monterey County (California). I've known she is just right for this visitation work to care facilities since she as a pup! Now is the right time. I confess I haven't done any volunteer work in a long time. I give to the local food bank, toys for tots, angel tree, etc but I should start giving of my time, too. Iam ashamed that I don't get out and volunteer. I did work at the Art museum for a while, but then got to busy with my own art. I donate money to the "food for A''' from time to time, and give canned goods to food drives, but I should be doing so much more. I am so blessed. I should share. Very good Kim! Good luck! I think it's great to "Pay It Forward" - especially during the holidays when everyone is supposed to be happy. But how can you be happy when you're hungry? You are doing a wonderful thing! I ask the post office for some of the letters to Santa. I pick one that speaks to me and buy a gift for that child.